The catalog provides descriptions of stories from various series, including the daily news, special reports, Milwaukee Newsreel, and Special Assignment programs. A few clips of news footage have been digitized and may be viewed online. Most of the collection must be viewed in its original 16mm format by appointment in the Archives Department of the University of Wisconsin-Milwaukee Libraries. The Archives hopes to digitize more news footage. You and your friends can vote for the news clips that you’d like to have digitized for online viewing! 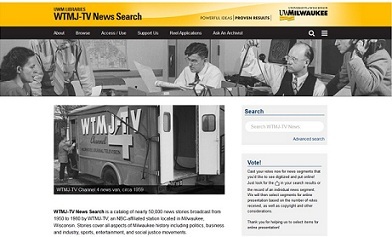 This entry was posted in around wisconsin and tagged archives, digital collections, fun stuff, history, journalism, mass media, media, milwaukee, news, reporting, research, television, web sites, wisconsin. Bookmark the permalink.